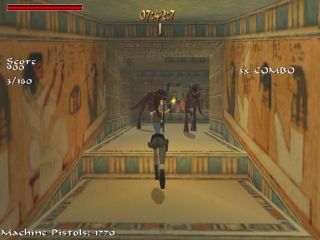 Designed as an expansion pack to Tomb Raider 4: The Last Revelation, and in commemoration of the Tomb Raider 20th Anniversary, celebrate by revisiting some well known locations from Tomb Raiders 1 through Chronicles, with a few extra surprises. With more combat than Tomb Raider 2 on steroids, leap and tumble head first into massive waves of enemies, leaving nothing but a trail of bodies and shell casings behind you! With a wide array of clothing inspired by designs taken straight from the classics, and over three dozen weapons, new and old - from pistols, shotguns, and rifles, to swords, lasers, and artifacts - Lara will always be dressed to kill, and armed to the teeth. With great skill comes great reward! Each of the outfits comes with a special transformation that allows Lara to push her skills to the limit, each of which has has their own abilities and attributes, from stopping time to teleportation. Compete against friends and community members as you fight to see who can become the top scorer. With a robust and flexible scoring system, everyone can be a winner!